Caterpillar has taken a huge hit from falling commodities around the world, and there's no reprieve on the way. The fall of giant equipment manufacturer Caterpillar (NYSE: CAT) is downright shocking when you look at the stock's performance versus the Dow Jones Industrial Average in 2015. But if you look deeper into the company's operations, the fall isn't so surprising. Beneath the stock's performance and the disappointing earnings results that have sent investors fleeing is a long-term deterioration in Caterpillar's end markets. 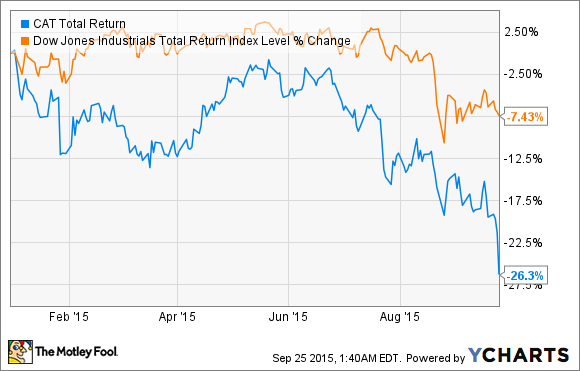 That, more than anything, is what's causing a rough 2015 for the stock, and it may not be over anytime soon. As much as we would like to think that companies control their own destiny, many times, they're beholden to the markets they serve. In the case of Caterpillar, a lot of the company's equipment goes to produce commodities consumed around the world every day, and the performance of commodities in the last few years has been nothing short of abysmal. You can see from the diversity of commodities I've included in the chart above that there's no relief for Caterpillar. 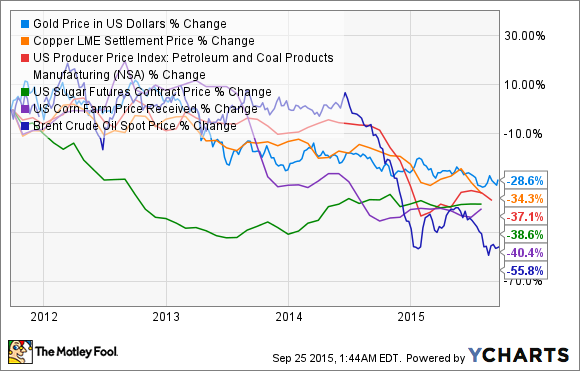 Metals are down, food products are down, and even energy is down. The result of falling commodity prices is that investment in drilling or mining for commodities drops. And the drop in investment can be quick. Look below at the U.S. Energy Information Administration's analysis of investment in oil and natural gas extraction in the U.S. You can see that the last year has seen investment drop nearly in half. That's a direct hit to Caterpillar's top and bottom lines. The fall in commodities isn't the only negative for Caterpillar this year, though. China has hurt demand as well. For two decades, China has been a consistent source of growth for companies like Caterpillar. The booming economy and an explosion in construction activity has helped companies weather the storms in the U.S. and Europe, but that thesis is now unraveling. China's economy has slowed to mid-single-digit growth this year, and many observers think it's actually in a recession. At Caterpillar, management is very worried about the slowdown there; sales in Asia-Pacific dropped an incredible 30% in the second quarter alone. China has now become a liability for infrastructure companies like Caterpillar, not a strength. That's a huge change for market observers. What's remarkable about a company like Caterpillar is that it's able to keep churning out profits even in tough times. For 2016, analysts are still expecting $4.57 per share in earnings, giving the stock a forward P/E ratio of 14. I don't think that's cheap enough to buy given the weakness in commodities long term, but if China begins to grow consistently, and commodities turn around, this could be a great way to play the recovery. Just keep an eye on those long-term end-market trends, because there's a lot that's out of Caterpillar's hands when it comes to demand for its earth-moving equipment.